Sometimes customers make silly mistakes – and win anyway. Sometimes lottery companies make very silly mistakes, and have to withdraw games, re-run draws or just apologize a lot with egg on their face. But whatever the problem, here’s where you’ll find all those stories. When lotteries make mistakes, it often benefits the players. 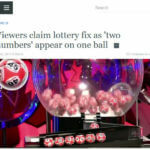 This is because many lotteries are willing to offer concessions in order to preserve the integrity of the games they offer. When lottery games are hit with technical glitches, it can be costly for the operator. 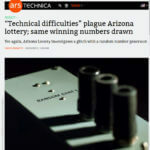 Such is the case with the Arizona lottery these days as it has been hit with the problem of duplicate winning numbers from supposedly random number generators. Having lottery draws televised improves transparency. But then any glitches become immediately apparent and sometimes cause controversy. This was the case in Saturday night’s Ireland’s Lotto Plus 1 draw where the top prize was £4.5 million. The Iowa Lottery issued an apology after a mistake caused sensitive data to be released. This time data about 2,967 winners of prizes $600 or more in 2011 were provided to a professor of journalism at the Grand Valley State University in Michigan. New Jersey’s High Card Poker scratch off game debuted on Aug. 7, but just three days later the lottery had pulled it off the market. The reason? A glitch in the ticket scanning app of the CT Lottery has caused it to misread winning tickets as losers for almost two full days. The erroneous readings were made between 12:25 p.m. The NZ Lottery’s Powerball draw hit a snag. And it was caught on live TV. Watch this! There was a hitch during the NZ Powerball draw on Saturday. Canada’s lottery regulators Service NL has launched an investigation into the Chase the Ace draw after evidence of duplicate tickets was brought to their attention. In light of the developments, the draw for Chase the Ace lottery originally scheduled for Wednesday in St.